Where Is Brazil Heading in Bolsonaro’s Presidency? “Brazil above everything, God above everyone,” Jair Bolsonaro’s campaign motto, plagiarized from Nazi Germany. “Today at 9 p.m. I was stopped by the military and lynched because, they said, I look like a drug smuggler. They said now Bolsonaro is the commander. I regret for having voted for Bolsonaro,” Douglas Barcellos on October 28, shortly after Bolsonaro had been declared the winner of Brazil’s presidential election. One week before the election, university students in Campinas city were banned by the Police for giving out Haddad tracts: “military dictatorship is back!” the policemen said. Jair Messias Bolsonaro is the 38th president of Brazil, elected with 55.14% of the valid votes, 44.86% of the Brazilians’ preference in the second round. At least 43 million Brazilians abstained from voting, annulled or voted blank, something like 29% of the entire contingent of voters. The former army captain received 57.7 million votes out of 147.3 million voters, that is, he was elected by 39% of eligible voters. Fernando Haddad, a professor, economist, political scientist, lawyer, and philosopher, received 47 million votes, 32% of the voters in a country of 210 million people. An expected victory after a large difference in favor of Bolsonaro in the first round, on October 7; shortly after that date, according to polls, the difference was day by day increasing even more in favor of the candidate whose professional propaganda structure was carefully set up, with no clear sources yet. The former army captain: As soon as his victory had been declared, in a national speech, Bolsonaro appeared eager to dispel concerns that he would govern despotically, vowing to govern respecting the Constitution, democracy, and liberty. “Enough of lies, enough of fake news in Brazil,” he hypocritically said later. Once again, Bolsonaro is not only vague but contradictory: he says some tragic thing, several days later he states that he has not said that and accuses others of spreading fake news, to soon say the same thing in even worst words. He refused to debate during the campaign, an omission that makes many people wonder about this project for Brazil – including among thousands of his supporters. The opponents state that Bolsonaro has no Project for the South-American nation; his supporters are not concerned about his Project, but by his declared “anti-Workers’ Party sentiment” [the party of Lula and Haddad] which justified their votes for the admirer of Adolf Hitler. The former army captain himself focused his campaign on that deeply hateful sentiment. At the same time, the Workers’ Party (PT) has promised to contest the electoral process in court, due to Bolsonaro’s innumerable threats, excessively aggressive incitement to violence, and the fact that he was funded by private companies, and spread fake news up to the last minute – in the election day, Haddad was falsely accused via WhatsApp of having raped an eleven-year-old girl. What does Bolsonaro’s victory means to Brazil? Is he really going to forget his old criminal sayings and doings, increased in this campaign, respecting the rule of law? Does the extreme right-wing now president-elect have any government program? Why has the Workers’ Party lost, and what does it mean to Brazil? These questions will be discussed below. 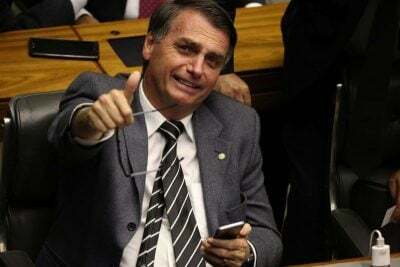 Like Donald Trump, Bolsonaro is inept and mediocre, from a cultural and intellectual standpoint; as in the case of Trump, the Brazilian president-elect believe much more in persuasion and force; similar to Trump who won US presidential campaign, the Brazilian neo-nazi is not sure now about what he will do in Brazil’s Presidency. So the Trump-Bolsonaro’s proximity goes far beyond the fact that Steve Bannon has advised both. As Bolsonaro’s candidacy has been confused in part as a tactic to reach everybody, he has been vague and fled debates for people not to know the essence of the unpopularity of his “proposals” to the country. He also fled debates due to his total lack of moral, cultural and intellectual skills. Not for not having a project as many people have said. Much likely, Bolsonaro’s absence in debates was due to afraid of himself as he is excessively talkative, but there is a program. His campaign, movements, and individuals in the favor of Bolsonaro dedicated much more to attack the Workers’ Party than to advocate for the then-extreme-right candidate, and his agenda. As never seen before in any campaign in the South-American country. Constructing more and more prisons – privatizing all of them instead of confronting social problems, also improving prisons trying to recover individuals and opting for alternative methods for minor crimes –, making the society free to get guns instead of discussing public security and social issues, the traditional war on drugs, the privatization of water and everything, no rights to workers and to minorities. Independence to the central bank, free to take every measure of big banks’ interests. This is Bolsonaro, eased out of the army in 1988, after trying to explode bombs in his institutions due to salary issues. Neoliberal policies are themselves empty and deeply contradictory, so Bolsonaro’s team feared, of course, the candidate debating face to face with his opponents, especially on the eve of the second round. His hysteria and deep intolerance would surely be much more evident and exposed to public shame along with every Bolsonaro’s anti-virtues. But cannot be said that there is no a program by Brazil’s president-elect. It has been much easier to keep the Brazilian society submerged in fear, hysteria, discrimination, hate, and blindness. Objectively, Brazil’s so fragile democracy, unlike some analysts have said, has not been overthrown by democracy last October 28, but by a strong network of false propaganda, and countless electoral and social crimes. By an omissive justice system. Not to mention foreign shadows behind the scenes. Surprisingly to many people, is the fact that the mainstream media, the Brazilian justice system and the people themselves, too hateful standing against corruption and political deceives since 2013, now keep silent before Bolsonaro’s endless lies and crimes. That is not a surprise at all if the last electoral process is considered a continuation of the coup d’Etat through former President Dilma Rousseff’s impeachment in 2016, and the criminalization of progressive sectors. As the far-right program has been hidden from most Brazilians, its only evident project is barbarism, accepted by almost 60 million Brazilians. A total confusion is just getting worse and worse in Brazil. In essence, Brazilians, stuck in hate by hidden powers, have been killing themselves by nothing. The Brazilian “left” has opted in favor of identity politics and sectarianism. The priority is not fighting capitalism and social inequality anymore. For this sector, if one does not share some social values like abortion, gender, and so on even tireless combating poverty under genuine progressive politics, is aggressively condemned and rejected, not considered a real progressive. As discrimination is strongly rooted in a historically authoritarian nation, the last one to abolish slavery in America, every “liberation” movement is permeated by this sentiment – discrimination against others and even against themselves. It is something very clear among Brazilians. The country, included the “left”, has not been preparing itself for the current political crisis, drawing for at least five years and a half. Until recently, talking to many “leftist” leaders one could feel them highly skeptical about a new military coup in Brazil. Particularly, the Workers’ Party (PT) rejected any constructive criticism even from progressive sectors, aggressively labeling them “fascists” or “radical left”, to lead its neoliberal policy with a human face for thirteen years in power, beginning with Luiz Inacio da Silva in 2003. Though important – and ephemeral – some social gains were achieved: e.g. the Family Allowance program (a continuation of the predecessor Fernando Henrique Cardoso’s School Allowance), and some real increase of the minimal wage. Despite these policies, social inequality in Brazil has prevailed. More generally we are dealing with a tragic crisis in so many sectors including public health, basic sanitation, access to justice, housing and working conditions, social and institutionalized discrimination, and public education. About the latter point, it is important to highlight that during the PT years, like its predecessors, Brazil under-invested a meagre 5% of GDP in education (during Lula’s government, this number was even below 5%). The PT hypocritically today manifests indignation towards Bolsonaro against indigenous people, as the party which presented itself as promoting a “Social Revolution”. In the PT years, the indigenous people were murdered by agribusiness landowners, who were supported by the PT party, like never before in the country’s recent history – when compared to the years of military government from 1964 to 1985 and the years of the Cardoso government (see this). The indigenous question during the PT years is another practical example of its authoritarian way of governing, only or, at the best, mostly concerned about keeping itself in power. As the party was never willing to dialogue with the grassroots during the 2013 protests when many people required a political reform, the then-President Dilma refused to even put it in the discussion: PT lost its greatest chance of being closer to the base of society, while winning the support of Brazilian oligarchy which subseuqnetly played a role in destroying the PT party. In the name of power, PT used to ally itself with the elites, never listening to claims that everything would end up in tragedy, to the party and Brazilian democracy. Worst of all, year by year since Dilma was impeached, the PT has refused to recognize its mistakes, something required even by internal militants. All in all, PT’s principal “project” for Brazil has been the same throughout since the inception of the Lula government, even since Dilma’s impeachment including Haddad’s presidential campaign. It consists in gaining political power, through alliances with the Brazilian elites and the Washington Consensus. So it has been relatively easy for the Brazilian and foreign elites to – once again – overthrow Brazil’s democracy. Now the PT desperately needs mass public support, which it has lost as a result of its betrayal of the Brazilian people. It is worth remembering that it was Dilma who passed the Anti-Terrorism Act on the eve of 2014 World Cup, which actually gave the police the power to repress public protests. The mainstream media attempted to portray both candidates as extremists. The difference however is that if Haddad had won the election won, there would be an election in 2022. Haddad is not an extremist, far from it; Bolsonaro is the most extremist president in Brazil’s presidential history. The “left” in general, attempting to preserve the PT, in its years in the Presidency, leading up to the massive protests in 2013 and in the last campaign, has ignored the PT’s social base. What has occurred is that their inaction has strengthened the extreme right. As mediocrity is the great winner in Brazil’s presidential election, the PT is the principal and a most pathetic loser; its national recovery is unthinkable for the coming years. The destruction of the national industry, of Brazil’s regional alliance and its inclusion in the BRICS, are the first evident tragedies Bolsonaro will continue to do, a job begun in 2015/2016 by Judge Sergio Moro, the mainstream media and the most corrupted politicians in the Brazilian Congress, when they overthrew Dilma. He also promises to withdraw from the Paris climate agreement and is eager to implement massive deforestation in the Amazon region, saying that the indigenous people do not want to live in a forest, which has to be given to big companies to produce. Large latifundia, according to Bolsonaro, are the wealthy and progress of the nation. Though the PT has not been a progressive party, what is also at stake in these elections is the privatization of water, Petrobras, Eletrobras (an energy public company), Caixa Economica Federal (a public bank). Last year, Temer invited the US Armed Forces to participate in joint military exercises in the Amazon, “to develop a greater knowledge, share experiences and develop mutual trust.” It is absolutely evident that Bolsonaro will continue to open Brazil’s doors to Uncle Sam’s Southern Command silent occupation of the world’s richest region in biodiversity – as Brazil’s Armed Forces themselves, who support him, does and did in the dictatorship times. It is worth remembering that, in his visit to Washington D.C. in October of 2017, Bolsonaro saluted US flag. The Bolsonaro regime, as it has catastrophically been presented, and Jair Bolsonaro character itself as Brazilians historically know very well, will not be able to minimally mediate democratic relations, far from it. In Brazil’s particular case, given the current social, political and economic crisis, such a possibility is even most remote – unthinkable, we could say. Bolsonaro’s “government” will be totally incapable of ordering that, and promised to cut even more social investments, far from good during PT years, which Temer started to totally destroy. Times sign to a disaster in the near Brazilian future. His anti-corruption speech cannot become reality, not even taking seriously as another Bolsonaro’s opportunist verbiage. His historical truculent and corrupted essence, and his agenda reinforce the possibility of a self-coup leaned on falsely fighting the internal enemy violence, and corruption itself. The militarization of Rio and the terror spreading across the country are examples that Brazil is an advanced Police State where, last year, 64,000 were killed – and Bolsonaro, a declared fan of Augusto Pinochet, has insisted that more assassinations, much more are necessary to combat violence in Brazil (!). In a country where 55 percent of people are black, Bolsonaro and his vice, General Antonio Hamilton Mourao, dare to state that Brazilians of African descent are second-class citizens. Bolsonaro will have to handle with the monster he has set up, the deep hate in many cases repressed for so long in a hostile society; an election campaign based on fake news is socially devastating. Sadly, democracy has been destroyed in Brazil by local and international oligarchies. This destruction has been embedded in the person of Jair Bolsonaro. With global capitalism marked by a deep-seated economic depression, Brazil’s power-brokers in alliance with Wall Street and Washington have chosen to substitute fragile representative “democracy” with a nazi-fascist regime. A neo-McCarthyism has been imposed. Blindness is the raw material for such an “ideology”. Given the world’s economic crisis, the Bolsonaro regime tends to be even more aggressive as any hard-liner, in such circumstances. As the Workers’ Party is one of the biggest lies in Brazil’s history, Jair Bolsonaro tragically is one of the truest faces, in his neo-McCarthyism and fascist agenda. Edu Montesanti is a frequent contributor to Global Research.